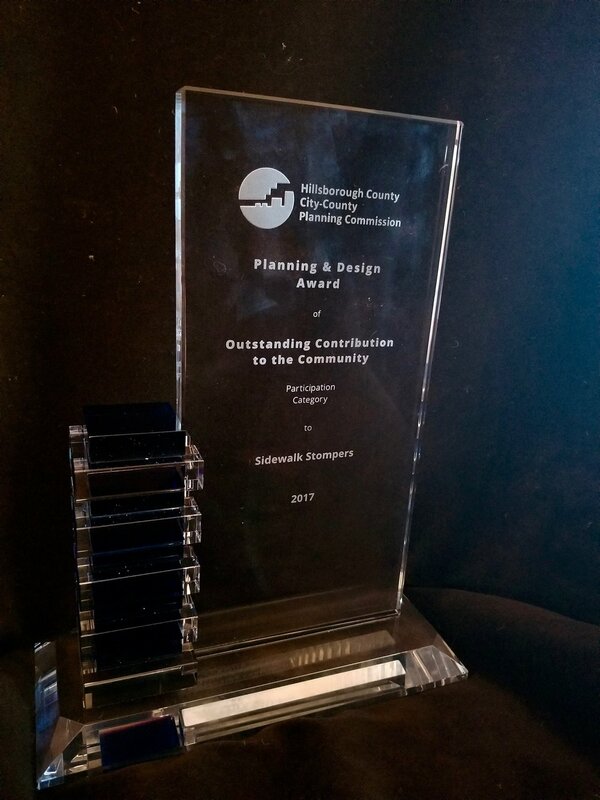 The Sidewalk Stompers are proud to announce that the Hillsborough County Planning Commission's 35th Annual Planning & Design Awards program has honored us with an Outstanding Contribution to the Community award for 2017. Sidewalk Stompers founders Emily Hinsdale, Tim Scheu and Vanessa Rukholm, along with Roosevelt Elementary School Principal Christina Dickens attended the award ceremony on Oct. 19th. "We were honored to be in the room with so many remarkable people in the planning community who have put together incredible projects ranging from 'complete street' initiatives to public art installations. We are very proud of the Sidewalk Stompers, the Roosevelt PTA, Palma Ceia businesses and especially the wonderful Roosevelt students and parents for their hard work, turning a weekly Walk to School into a neighborhood initiative that can truly engender positive steps toward building safer routes to school," says Emily Hinsdale. Thank you to the Planning Commission for the award. Thank you to Walk Bike Tampa, Lisa Silva, and Cindy Stuart for their encouragement and support. Thank you Roosevelt Elementary School! Can't wait to see where we can walk together next! Sidewalk Stompers does not endorse any particular candidate for public office or corporate sponsor, and has no agency relationship with organizations to which it may be linked.